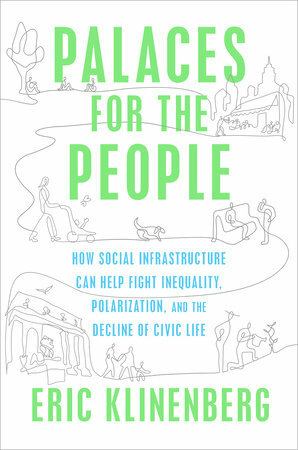 The book is a cheerful but measured account of how public institutions and places where people gather and interact can, as the subtitle of the book indicates, “help fight inequality, polarization, and the decline of civic life.” Klinenburg notes that in the United States and elsewhere “the social order now feels precarious.” Economic inequality is intensifying, more and more people are isolated by their electronic devices and digital bubbles, and our politics are fueled by toxic animosity. He argues that rebuilding positive societal bonds will require not just a thriving and equitable economy or flourishing voluntary and civic groups but also “the physical places and organizations that shape the way people interact.” Examples include common institutions like public libraries, community gardens, neighborhood schools, and public athletic fields but also cafes and barber shops where people hang out and forge relationships. Klinenberg shares a number of ebullient stories about people enjoying and benefiting from these places, as well as insights from his own research on the relationship between social isolation and health during a devastating heat wave in Chicago. For me, however, the most compelling bits of the book are the lively snippets and summaries of other people’s research. For instance, he relays a study that found 90 percent of Americans think public libraries are crucial to their community whereas almost “every other major institution (government, churches, banks, corporations) has fallen in public esteem.” For anyone who’s spent a lot of time in public libraries (like I have), this is no surprise given the range of things they provide, such as digital bowling leagues for the elderly, spunky story time for kids and parents, and hip hop video-making classes for youth. Unfortunately, funding in many municipalities for public libraries is decreasing. He also describes several fascinating studies related to crime, including one amazing (and troubling) research project in the Netherlands, where researchers got permission to create disorder in one neighborhood by spreading litter and graffiti and not in another and studying the effects. The aim of the project was to better understand how the physical environment impacts crime rates. This study inspired some American researchers to examine (already existing) data on the correlation between abandoned buildings and crime in Philadelphia. As you might imagine, it turns out “abandoned houses are good places for people involved in criminal activities to hide” and abandoned lots great places to stash drugs and guns. In follow-up studies, the academic researchers along with community residents examined how relatively inexpensive programs to fix up these houses and turn vacant lots into parks had a major positive effect on the neighborhoods and didn’t simply displace the crime elsewhere. The important overall point of these studies is that crime is best managed not through hyper-focused attention on individual offenders but shaping the environment where crime occurs. There are a few shortcomings of the book. For those familiar with the general concept and importance of social infrastructure, there aren’t really any major novel insights here or provocative arguments that will immediately spur discussion. In addition, at times Klinenberg flits from example to example when I wished he would dig in deeper. But the book serves as a smart, compelling, and enjoyable introduction to the essential role social infrastructure plays in our lives and communities, a strong case for strengthening it, and a great resource for further study. Another reviewer of the book called it a “love letter” to public libraries, an assessment I agree with. It also felt like a love letter to many of the important places and organizations here in Madison and Dane County that MCF donors support—a call to action, even, to continue to support these essential community building blocks while also looking for new or neglected forms of social infrastructure to support as well.